Ambient rock band Flights have only been in Chicago for a few months, but are already working hard to make their mark on the scene. 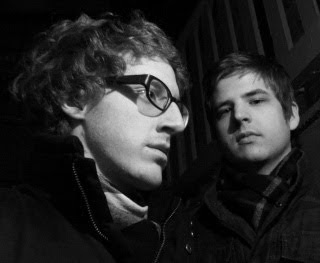 The duo, Eric Hillman and Brian Holl, will play a September 2nd show at the Empty Bottle and have also been spreading the word by giving away their music for free. As a band new to Chicago, what’s the story behind Flights? What brought you to the city? Brian and Eric: Flights truly began after years of sending ideas and sounds over the Internet - Eric being in Boston and Brian in Milwaukee. In January of 2009, we had a goal to record some songs in Wisconsin that started from said ideas without any real knowledge of how to see them come to fruition. After months of re-organizing, composing and recording, we came up with the four songs that make up Living Bodies, our first release. The story begins long before that though, as Flights gained moderate but scattered success in Milwaukee as a four piece band with a different lineup. The success was short-lived solely because of the geographical distance between the band and Eric, who was pursuing a degree in film-scoring at the time. The hiatus ended in May of 2009 when we located ourselves and focused on making Chicago Flights' new home city. Tell us about your EP, Living Bodies, and your overall sound. What can people expect to hear? Eric: Living Bodies is as much an introduction, an unfinished thought, as it is a final product. After working very comfortably in our piano-rock style for years, Brian and I knew that our hearts and minds yearned for a change. With this EP we took our first step into that world. A world full of new sounds, new ideas, and a DIY approach that was at times frustrating but overall incredibly rewarding. Many people have compared our sound with that of Radiohead, Bjork and Sigur Ros, but we know that we will always strive to grow and create a unique sound that is solely our own. You’re releasing your music in the form of online “Packages.” Tell us more about this and how you decided on this approach. Brian: We came up with the idea after wanting to give our music away for free, seeing the current business model in the music industry - selling songs - hard for young acts like us. We want to break into Chicago and gain true fans through our music the quickest way possible. Music is still a valued commodity in our society, and the filtration process has been set more and more on the public. What I mean is that word-of-mouth is king for marketing, and we want to utilize this to gain fans. We hope that our music inspires listeners enough to tell the people around them about us. Giving our music away for free, in what we call "Packages" - online compressed folders filled with various forms of media we create - was the quickest way for getting our songs into the hands of people who wanted to listen. What do you feel Flights can offer to the Chicago music scene that sets you apart from other bands? Brian: I think we fill the void between the experimental groups and rock groups in Chicago. We have a very ambient sound, comparable to Sigur Ros at times, but also an edge that hits and could remind people of Radiohead. We try to play off of our influences, but never write with a specific style in mind. A song we write could be compared to Bjork or Steve Reich, but we never write without our own intentions and intuition prioritized first. I think you'll always hear crossovers in music from now on. As anyone will tell you, "it's all been done before." As a duo, how do you make your music work live? Eric: As just two people with very large ideas we knew that we wanted to produce music on a grand scale, and to do this we knew we needed to draw together a group of talented musicians to help make our ideas a reality. The first person to join us was now permanent drummer, Alec Lacasse. He wrote and recorded Living Bodies with us and provided a incredibly unique energy and insight into the overall feel of the EP. However, after spending months meticulously creating all the sounds and textures of Living Bodies we knew that we couldn't allow those to be lost in translation when played live, so over the past few months we have gathered a talented group of friends and local Chicago musicians to help bring our full sound to the stage. As you gear up for your September 2 show at the Empty Bottle, what do you want people to know about a Flights show? Why should they be sure to make it out? Brian: Right now, we're not even sure what a Flights show will be like - hah. We've never played out with this music, or the members, aside from Eric and I. What I do know is that we will be putting our entire souls into the show, as we do with our music. I think the night will follow our songs - very dramatic, emotional and epic. Brian: Well, the show is our number one priority right now. After September 2nd, we'll be playing Milwaukee, Madison, and shooting for some various college towns. We're trying to be picky with Chicago right now, as we want to play with bands who inspire us and don't want to hit the market too hard. We'll also be doing different press opportunities like in-studios for radio, live studio sessions for blogs and in general getting our name out there to raise the awareness of Flights. Brian: We have a blog, "Young Men Walking," that we update regularly that should be the first place people go to for Flights news. You can view it at flightsmusic.blogspot.com. We also have a MySpace page (www.myspace.com/flightsmusic) and are on Facebook as well - search Flights in the pages section. We look forward to hearing from you!